As you may have noticed in yesterdays post, I am a big fan of Christmas jumpers. To me, the cheesier the better, and a big ol' polar bear wearing a santa hat is exactly what I need to get me in the Christmas spirit. Mine was a very cheap one from Primark, as I know it's only going to be worn for a couple of weeks over the Christmas period and then next year I'll buy another. But I thought I'd scour the internet and find a selection of my favourites, just in case you haven't found yours! I've kept the price range to below £50, simply because I keep looking at Christmas jumper posts on blogs and they are all far too expensive for little old me. And considering 99.9% of you minions are teenage girls, I'm hoping you'll also appreciate this! Today I am still feeling suitably full from fake-Christmas and have spent the day finishing all of my university work. Finally, after just under a month of intense essay writing, I've completed all six of my assignments and am feeling like a very happy chappy and finally am ready to get into the Christmas spirit without the threat of deadlines hanging over me. Somebody, please pass me the Bailey's! 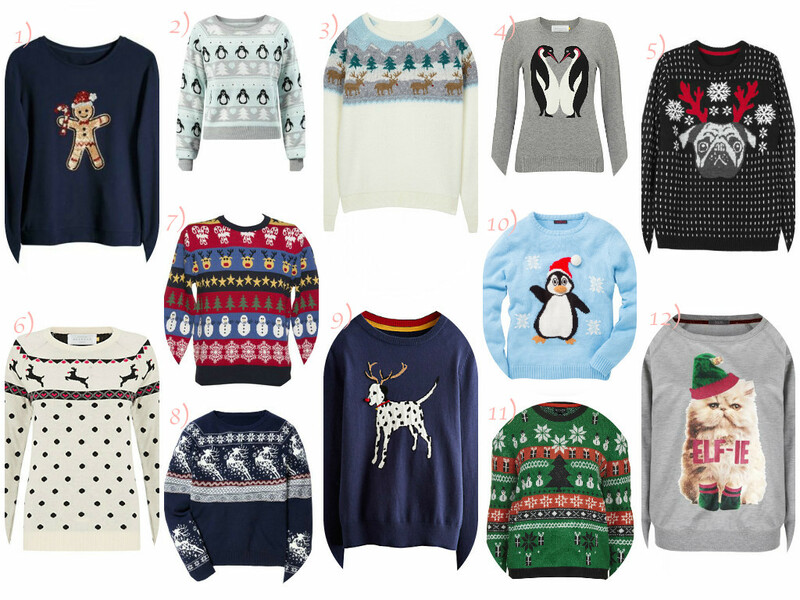 These are some of the absolute treasures I dug up when on the search for a lovely warm christmassy jumper! I do love the pug one but I think number 6 might be my favourite, a bit of a tone down from the cheesiness of my current one, that's for sure! I hope your weeks have gotten off to a good start! Number 4 and 9 are so funny! Oh I love the first one, anything with a gingerbread man just gets me! I love the last one with the cat!